(Phys.org)—While traveling with a group of researchers in the Amazon rain forest this past September, biologist Phil Torres came upon a type of spider he'd never seen before. Upon closer inspection, it turned out the spider wasn't a spider at all, but a decoy created by a real spider. He documents the find in a blog post for Rainforest Expeditions. In consulting with experts in the field, Torres has come to believe that the tiny striped spider is a member of the genus Cyclosa, which are known for adding material to their nests to either attract prey or hide from predators. In this case, it appears the spider has developed a special skill to help it avoid being eating by paper wasps. Not only does it build pseudo-replicas of itself, in larger form, it shakes the decoy to convince passersby that the fake spider is the real McCoy, causing the fake to be attacked instead of its own tiny self. 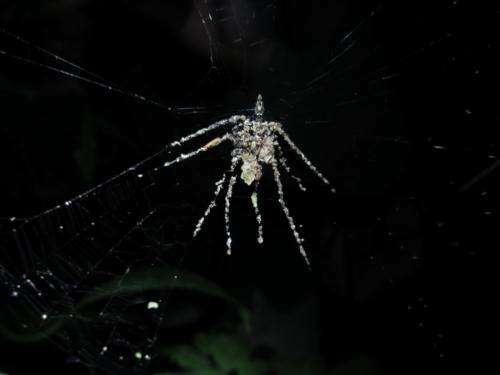 The webs of the spiders stand about face high, Torres reports, and are about the size of a stretched-out hand. The spider itself is about a quarter of an inch in length while its decoy is about a full inch. In surveying the area, Torres and colleagues found 25 of the arachnids in a single square mile in a floodplain in Peru on the western edges of the Amazon. Outside of that area, they found none, though Torres notes that it's possible that beyond the range where they looked, there could be many more. 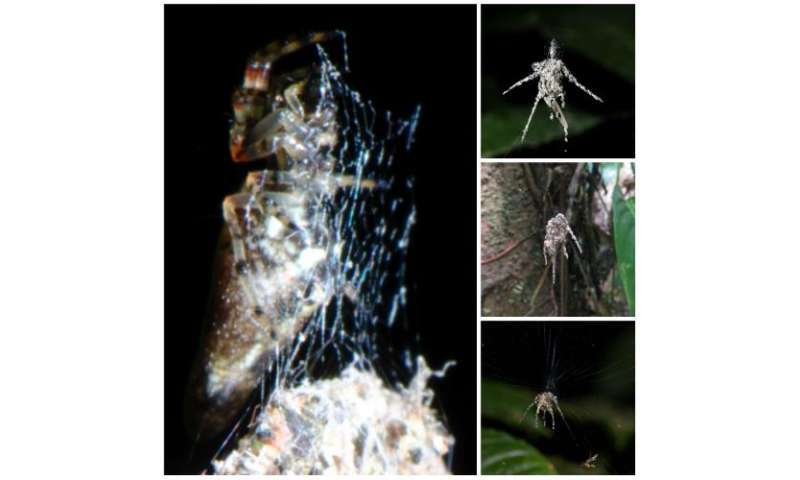 The actual spider (left) and examples of the constructed, false spiders (right). Credit: Jeff Cremer and Phil Torres. In examining the decoys, Torres found them to be made up of compiled masses of dead insects, leaf bits and assorted debris. And while each was somewhat different from all the others, the overriding theme was the image of a spider, with legs and a body that resemble the real thing. Torres isn't sure yet if the spider he's found is a new species – a thorough review process will have to be undertaken before that can be established. Once it passes muster, the findings will then have to be published in a science journal for it to become official. "It's a trap!". I wonder if these supposed decoys allow the spider to convert his paper wasp foes from attacker to prey. Uhm. Look at the 'decoy' again. That thing has two arms, two legs, a head, and a midbody appendage. If not a hoax, there are deeper implications of this species' intelligence. Or it was made correctly but the wind, rain, and the occasional broken web causes it to change in shape. Simple logic.